Anyone who dabbles in older and antique furniture knows that the name “Stickley” is an important one in American antique furniture. And everybody knows that Gustav Stickley made much of the high-priced Mission style furniture that currently enjoys so much favor in the auction market. Is that all there is to it? Not by a long shot. 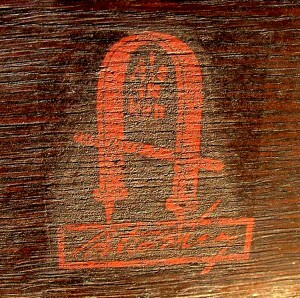 There is no mistaking Gustav Stickley’s unique red decal with the joiner’s compass and his trademark quote “Als ik Kan” – All I Can Do. When you see a tag marked “Stickley” or hear the auctioneer mention that the next piece is a “Stickley” piece, it doesn’t mean you have found a treasure. You may have, but you need to dig deeper. There were actually five Stickley brothers and they were all involved in the furniture industry in some way or another in various combinations in the late 19th and early 20th century. The five brothers were Gustav (1858-1942), Leopold (1869-1957), Charles (1871-1921), John George and Albert (d. 1928), all the sons of German immigrants. Gustav was the oldest and ultimately the most influential. He was the purist and the theorist who provided the artistic foundation for the rest of the clan. In 1884 three of the brothers, Gustav, Charles and Albert opened the first formal furniture venture of the family in Binghamton, N.Y. 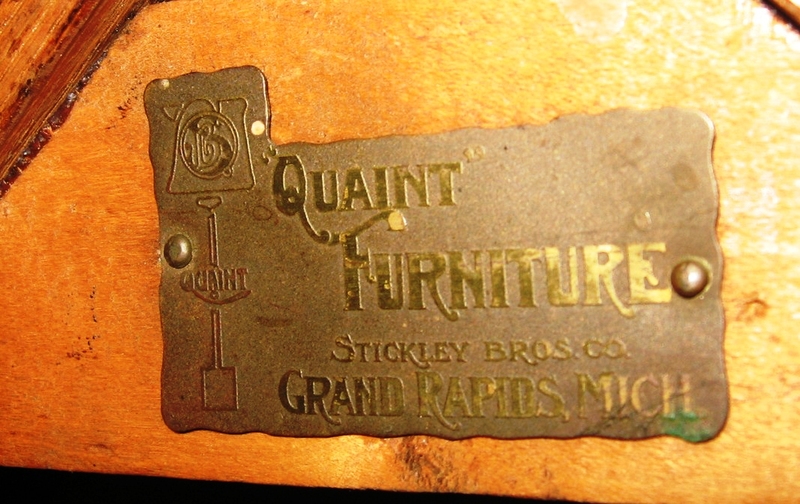 It was originally called Stickley Brothers Furniture Co. and later was known as Gustav Stickley Co. Charles left almost immediately after forming the company and opened his own operation with an uncle. Charles’ new company was known as Stickley-Brandt, also head quartered in Binghamton. It originally made Victorian design furniture and then turned to the Mission style, specializing in chairs. This company went out of business in 1919, a victim of World War I and the dying Arts & Crafts market. 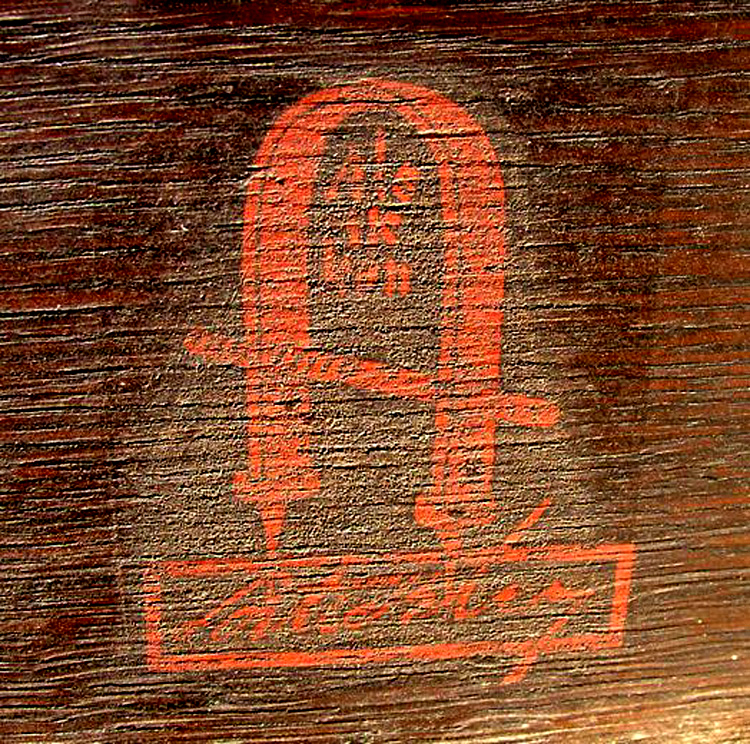 This is the mark of Stickley Brothers of Grand Rapids used in their original Mission style line called Quaint Mission in 1903. Albert left the original company and went to Grand Rapids, Mich. to team up with brother John George to form the new Stickley Brothers Furniture Company in 1891. Initially, the company produced occasional chairs and tables in a wide range of styles from Colonial Revival to early Mission. John George left the company in 1900 but Albert soldiered on by himself, helping to develop the first “Quaint” line—the “Quaint Mission.” The various “Quaint” lines were to characterize Stickley Brothers furniture for the next 50 years. After “Quaint Mission” came “Quaint Arts & Crafts” in 1904. Then, turning attention back to Colonial Revival, followed with “Quaint Tudor,” “Quaint Manor” in 1914, “Quaint American” in the early 1920s and “Quaint Colonial” in 1925. Even though Albert died in 1928, these variations of early furniture styles continued until the company closed in 1954. 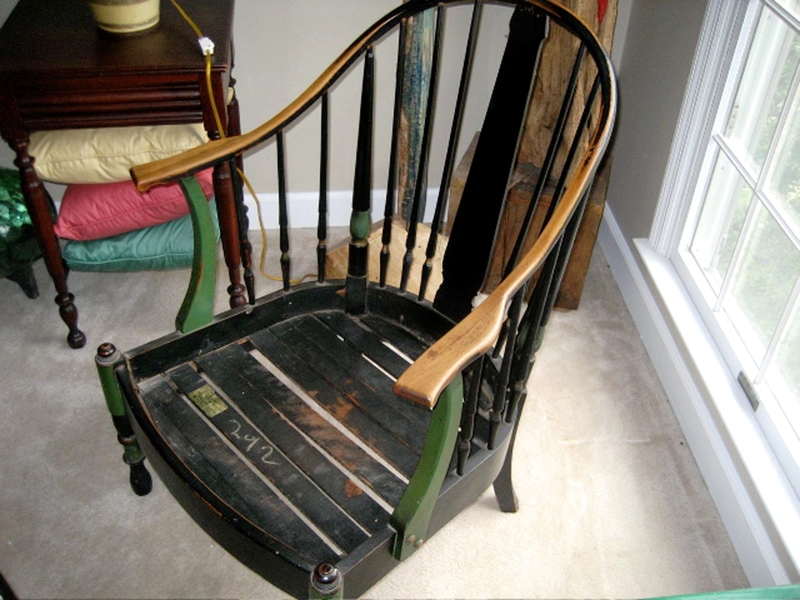 This is a revival style chair from Stickley Brothers from the 1920s and 1930s. When John George left Stickley Brothers in 1900, he paired up with brother Leopold to buy the firm of Collins, Sisson & Pratt in Fayetteville, N.Y. By 1904 it was reincorporated as L. & J.G. Stickley, Inc. and it introduced its first original line, “Mission Oak” in 1905 at a trade show in Grand Rapids. In 1922 Leopold introduced the “Cherry Valley Collection,” placing the firm squarely and permanently in the Colonial Revival market. After his brothers deserted him in the original business, Gustav took a trip to Europe where he was inspired by English reformers William Morris and John Ruskin. He returned to America with a new zeal for producing a line of handmade furniture based on honesty and simplicity of design. Even though he founded his United Crafts shop in 1899, he also found an outlet for his work in the Tobey Furniture Company of Chicago. His unsigned Arts & Crafts pieces carried only the Tobey label until 1901, when he formed his Craftsman shop and began to mark his work with his own label. 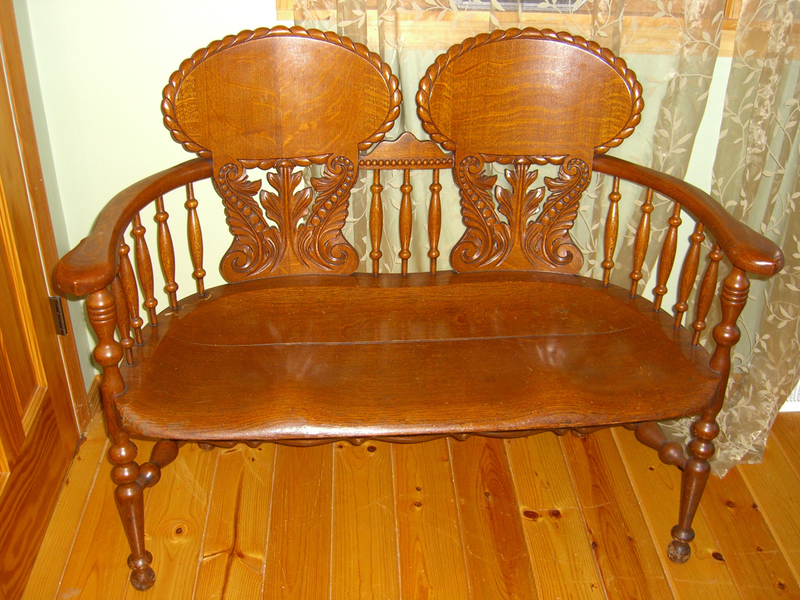 This oak bench was made by Charles Stickley of Stickley-Brandt around the turn of the 20th century. As influential and dominant as Gustav was in the field of Mission design and construction, imitation by competitors, including his brothers, eventually led to his demise. He declared bankruptcy in 1915 and his shop was acquired by L. & J. G., which operated it as The Stickley Manufacturing Company. 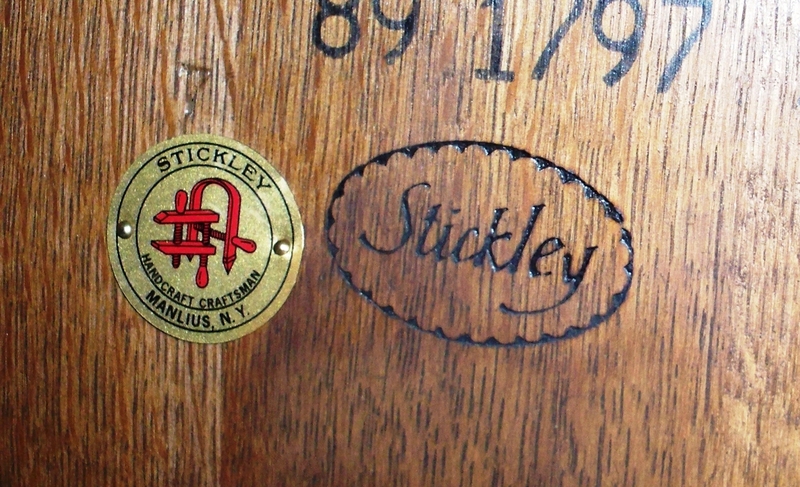 This is the mark of the only surviving Stickley company, L. & J.G. Stickley of Manlius, N.Y. So, does the Stickley name imply that you have found your treasure? The real question is which Stickley name and how is it proven. A piece with one of Gustav’s original brands or tags is the best. Mission style made by L. & J. G. is the next best, but an unmarked piece could have been made by either of them or by someone else, because so many virtually identical pieces were made during the popular period. Pieces marked with other variations of Stickley companies may carry a premium but generally not much more than any other quality line of furniture. Just be sure to determine which Stickley you have found. Send your comments, questions and pictures to me at PO Box 215, Crystal River, FL 34423 or e-mail them to me at info@furnituredetective.com. Visit Fred’s newly redesigned website at www.furnituredetective.com and check out the new downloadable “Common Sense Antiques” columns in .pdf format. His book “How To Be A Furniture Detective” is now available for $18.95 plus $3 shipping. Send check or money order for $21.95 to Fred Taylor, PO Box 215, Crystal River, FL 34423. Fred and Gail Taylor’s DVD, “Identification of Older & Antique Furniture,” ($17 + $3 shipping and handling) are also available at the same address. For more information call 800.387.6377 (Monday through Friday only, from 9 a.m. to 4 p.m. Eastern Time), fax 352.563.2916, or e-mail info@furnituredetective.com. All items are also available directly from the website, www.furnituredetective.com.